Adobe abandoned Firefox for Linux users years ago, but new compatibility layer software can help you ditch your outdated Flash version for the latest code. Mozilla will stop supporting most browser plugins in Firefox by the end of 2016 . But for Linux users, that won’t make a major difference for one of the biggest plugins in the browser world—Adobe Flash. You may not know it, but Adobe axed most support for Flash in Firefox on Linux back in 2012. Fear not, though: An open-source wrapper allows Firefox to use the fresh Flash code that Adobe’s still pumping out for other browsers. Mozilla has announced plans to stop supporting most NPAPI plugins in Firefox by the end of 2016. But they’re still going to support Flash, because it’s still—sadly—a big part of the web. That said, if you’re using Firefox on Linux, your Flash player is alreadyyears out-of-date. Adobe stopped supporting the NPAPI version of Flash on Linux back in 2012, and now only updates it with security fixes—and even those will end on May 4, 2017, five years from the release date of the last supported version released. Adobe points Linux users at that Pepper (PPAPI) version of Flash, which is included with Chrome and can be installed in Chromium and Opera. The outdated Flash 11 available in official repositories. But Mozilla doesn’t want to support Pepper. It would rather try to push new web standards instead of creating new frameworks for old-style plugins. This leaves Firefox users on Linux with Flash 11.2 while other platforms—including Chrome and Chromium—are already up to Flash 19. Want the latest version of Flash on Linux? Switch to Chrome, Chromium, or Opera. That’s the Adobe party line. Really, we should be happy this is even an option, as Adobe hasn’t had much love towards Linux in general. That PPAPI-on-Linux code is used when the Flash player runs on Google Linux-based Chrome OS, however, so Adobe can’t afford to snub Chrome on Linux. If you want the latest version of Flash in Firefox, the Linux community has come to the rescue. Fresh Player Plugin is an open-source PPAPI-to-NPAPI compatibility layer. Basically, it’s a way to use the up-to-date Pepper version of Flash for Linux in Firefox on Linux. It can even use hardware-accelerated decoding of videos on the latest Linux distributions, including Ubuntu 14.10 and 15.04. Fresh Player Plugin has now been in development for more than a year, and it should be fairly stable for most people. It doesn’t implement any sandboxing, however, meaning that all those Pepper sandboxing security benefits aren’t available to Firefox users, so beware. It’s still safest to run the latest version of Flash in a Chromium-based browser like Chrome, Chromium itself, or Opera. 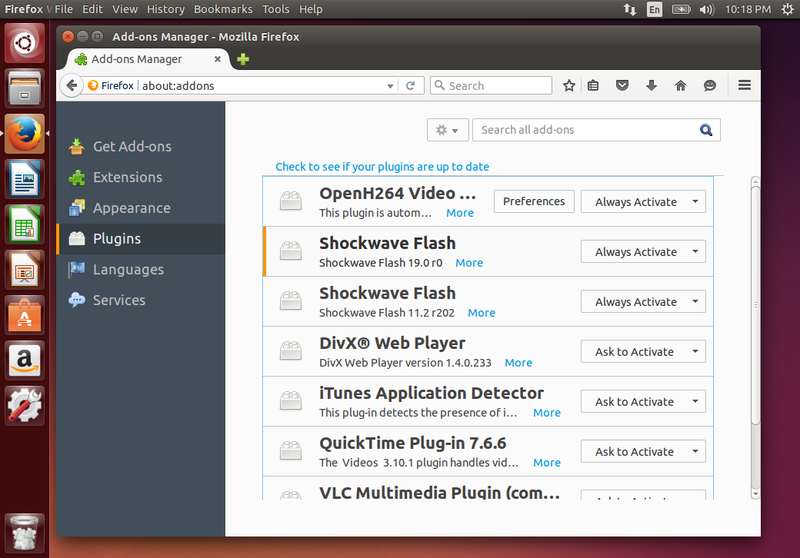 Adobe Flash 19 in Firefox for Linux, courtesy of Fresh Player Plugin. You now have the compatibility layer installed. All you have to do is install Google Chrome and launch it—it will download the latest version of the Pepper plugin. When you launch Firefox, Firefox will automatically load Fresh Player Plugin, and it’ll check the directory Chrome stores its plugins in and automatically load it. 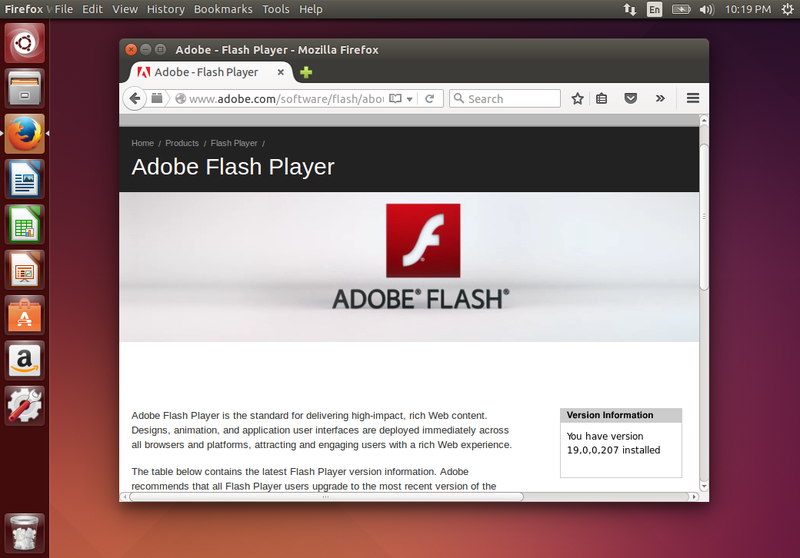 You now have the latest version of Flash in Firefox on Linux. Just uninstall the freshplayerplugin package from any software management tool if you decide you’d rather not use it. 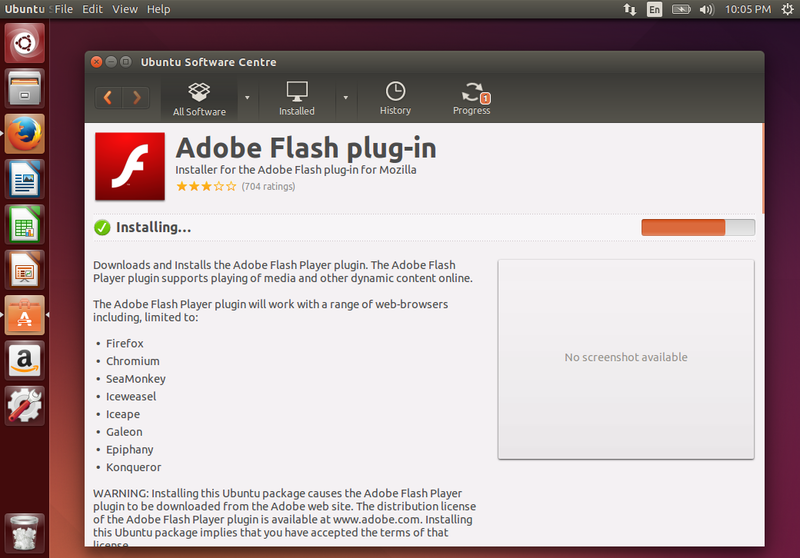 If Adobe does end security updates for the NPAPI version of Flash on Linux in May 4, 2017 without proving a path forward for Linux users, Fresh Player Plugin will become the only way to use a patched version of Flash in FIrefox on Linux at all. It’s good this software is being developed, as it may become very important soon. Hopefully most of us can just dump Flash by then.